Ahoy, Mateys! 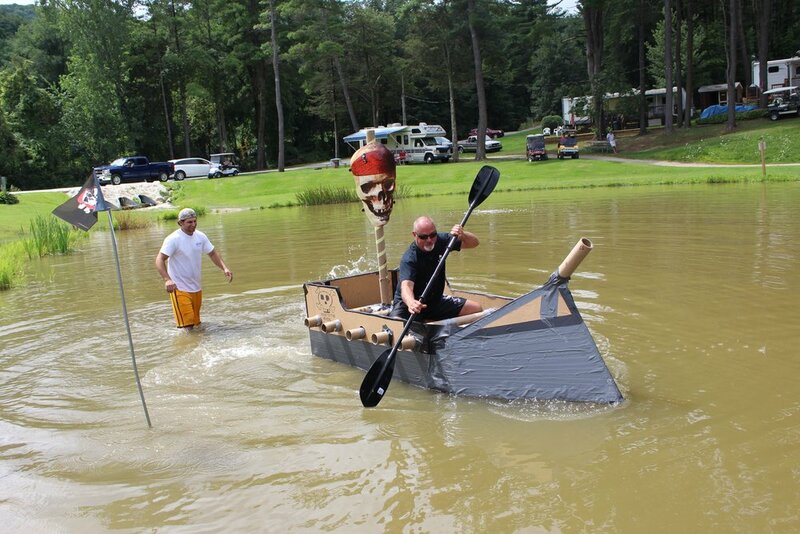 Enjoy our Pirate Pool Party at 7PM, walk the plank, and sink or sail during our Cardboard and Duct Tape Boat Race. The cardboard boat regatta starts with a qualifier race which has three age divisions: 7 and under, 8-12 years, 13-17years, & 18 years and over. All boats in round one must already be built at time of the race, and can use as much duct tape and cardboard as needed. Boats may be powered with oars or paddles of the captain's choice and can only be sailed once by only one person. The 6 and under age group will get their trophies at the end of round one. *Boats in all age groups are not allowed to be built in a surfboard fashion. Boats must be built so that the captain can sit in the boat. Use of sonotubes or other specialty cardboards are not allowed. The top three captains of the 8-12, 13-17, & 18 years and over age groups will move to round two, where identical "cardboard boat kits" will be provided to each qualifier, and have until 7PM that night to make a new boat. Bring the Cardboard and Duct Tape Boat Race registration to Lori's Pond. On August 10, Clearview (CR) will be in the Hayloft Lounge from 7PM-11PM.